Some of them look like curling irons, while others resemble crock pots and slow cookers. Available in various types and sizes, sous vide devices are becoming increasingly popular. So, what is sous vide exactly? Well, it’s a cooking technique that means “under vacuum” in French. This cooking method — pronounced “sue-veed” — used to be reserved primarily for fine-dining chefs, but now, home cooks have taken a liking to it because it makes it easy to cook a steak that tastes like a meal you bought at a four-star restaurant. The best sous vide machines only make the process easier. Like most kitchen gadgets, however, not all sous vide machines are created equal. You have self-contained sous vide ovens that heat the water quietly using insulated walls and a PID-controlled heating element, as well as immersion circulators that use a heat source and pump to heat and circulate the water. You also have smart machines, basic machines, and various sizes to choose from. So, which is the best? Read on for all the details — after all, not every machine allows you to infuse your own spirits. Why you should buy it: It’ll cook the perfect steak, and you can control cooking with a smartphone app or your voice. Who’s it for: Those who want a small device they can use to make easy, restaurant-quality meals at home. Also, those who value a smart kitchen and the ability to control small appliances with apps. We picked the Joule for its durability, integration, speed, and power. ChefSteps constructed the Joule out of extruded polycarbonate and stainless steel, which gives it added strength and durability. The machine also features a magnetic base, which makes it stick to your pot without a clamp. In terms of integration, the Joule sets trends and rises above the rest of the pack. 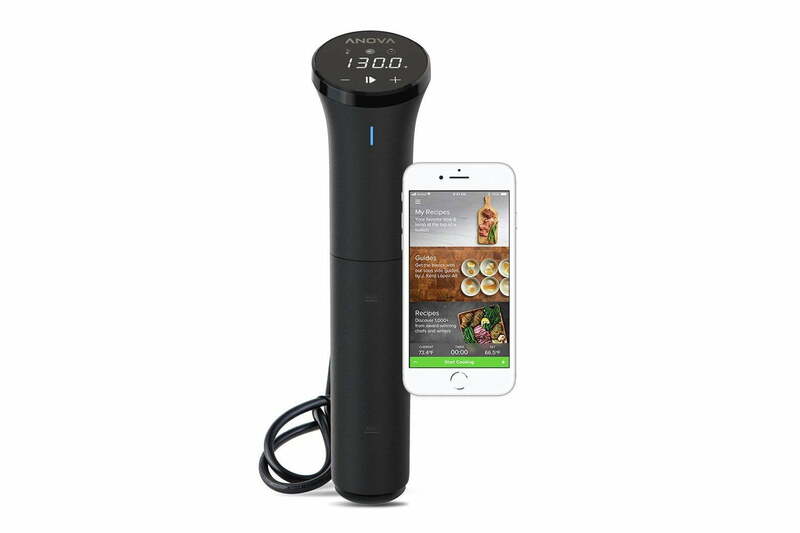 You can connect this immersion circulator to your smartphone or tablet, and use the app’s visual tool to select how you want your steak to look when it’s done. Have raw meat on your hands? 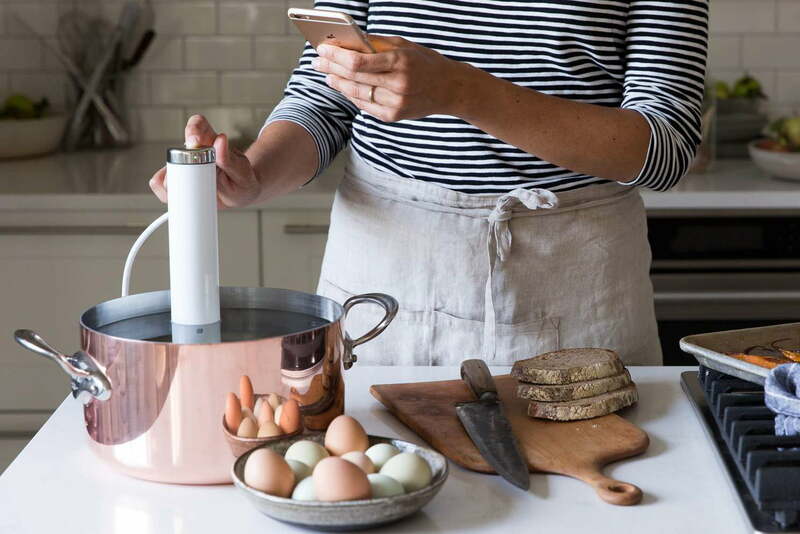 You can even connect Joule to Amazon’s Alexa or Facebook Messenger, which will allow you to simply say “Joule, cook a steak” after you’ve placed the steak in the pot. You can then walk away until your food is ready. Because of Joule’s smart integration, you can cook a steak and a side of vegetables and only spend a total of six minutes in the kitchen doing prep work. Boasting 1100 watts of power, the Joule is powerful enough to heat your water quickly. Of all the immersion circulators we tested, the Joule heated water the fastest, bringing 4 quarts of water from room temperature (78 degrees Fahrenheit) to 135 degrees Fahrenheit in less than 10 minutes. The manufacturer recommends a maximum water capacity of 2.5 gallons when you’re cooking without a cover, and 5 gallons if your cooking with a covered pot. This is a large enough capacity to accommodate a large family or a small dinner party. Some people also worry about immersion circulators being annoyingly loud. Thankfully, the Joule is surprisingly quiet considering its speed and power. It’s about as loud as the sound of boiling water. As with any machine, however, there is always room for improvement. The Joule doesn’t have a display that indicates the time or temperature, which can make cooking more difficult for some users. The only thing you can control from the actual device is the power setting, meaning you can turn the device on and off. You must control all of the cooking settings using an external application, such as the mobile app for Android and iOS. If you’re not the type of person who wants to use a smartphone app or something like Alexa to control your kitchen appliances, the Joule may not be for you. Why you should buy it: The flexible device is great for just about anyone, whether you’re an amateur or professional chef. Who’s it for: Those who want the option to control their sous vide machine with an app or their voice. Instead of using a magnetic base, the Anova clamps onto the side of your cooking pot. It’s secure once in place, but it does require you to fiddle with it for a few seconds to get it just right. Flexibility is where this immersion circulator shines. It offers similar integration to the aforementioned Joule, allowing you to control the device with your smartphone, tablet, or smart home devices such as Alexa and Google Home. However, the Anova also features an LCD display and an LED-backlit scroll wheel for users who don’t want to control their device externally. If you’re the type of person who wants the flexibility to cook your meals with or without additional peripherals, the Anova is a good choice, as it offers more flexibility than most competitors. When compared to the Joule, though, the Anova is less powerful in terms of its wattage. This doesn’t have much impact on its maximum capacity — 4 to 5 gallons, per the manufacturer’s recommendations — but it does impact how fast it heats water. For example, it took more than 20 minutes to heat 4 quarts of water from room temperature to 135 degrees. Why you should buy it:Anyone who wants to try sous vide cooking without spending a ton of cash will like this device. Who’s it for: Those looking for an affordable sous vide machine that doesn’t take up a lot of space. Anova, a well-known brand in the sous vide world, really hit the mark with the Nano. It’s only 12.8 inches tall, which makes it small enough to fit in a kitchen drawer, and you can attach it to virtually any pot that’s large enough to hold your ingredients and desired water capacity. Speaking of water capacity, the 750-watt Nano can heat up to five gallons of water to temperatures between 32- and 197-degrees Fahrenheit. One issue we sometimes see with budget sous vide machines is a lack of accuracy. Maintaining the perfect temperature in that water bath is vital, as it means the difference between perfectly cooked steaks and unappetizing, dried out cuts of meat. The Nano maintains the water bath temp within 0.1 degrees Fahrenheit accuracy. Nani’s Bluetooth BLE 4.2 also allows you to use your phone to remotely control the machine, and the app has easy-to-follow recipes where you can push a button to start. You can also create your own recipes in the app. While the Nano has a lot to offer, it’s not perfect. We felt the clamp was not designed as well as it could have been, as it doesn’t open wide enough. The Nano isn’t as powerful as other sous vide cookers, so you must be a bit more careful not to overload the water bath with too many food items. In spite of these downsides, the Nano is more than worth the small investment. Why you should buy it: Those who plan to do a lot of sous vide cooking will appreciate this oven, which can hold lots and is made of quality materials. 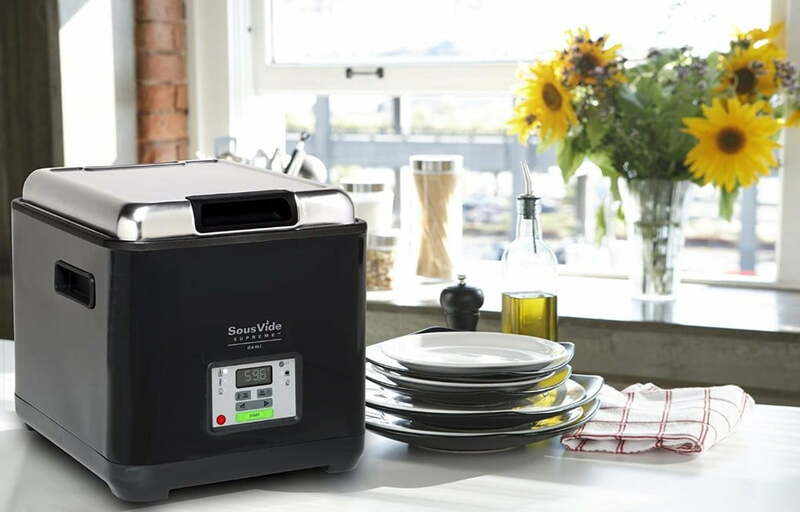 Who’s it for: Anyone who wants a reliably and ultra-high-quality countertop sous vide machine. 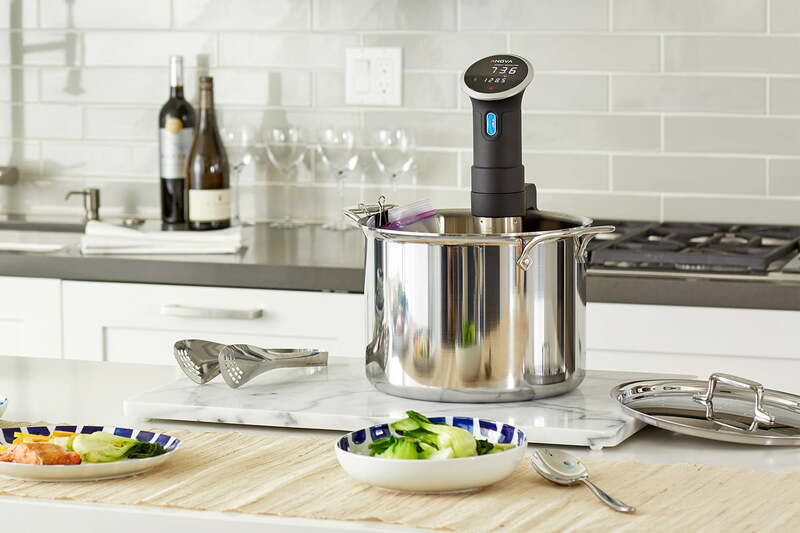 The Sous Vide Supreme brings sous vide cooking to home cooks. Their water ovens are high quality, yet affordable enough for non-commercial use. The Demi water oven is compact, measuring 29cm x 28cm x 33cm (approximately 11.3 inches x 11 inches x 13 inches). It’s about the size of a crockpot, and you can easily store it on a countertop or in a cabinet. The Demi water oven has double walled insulation and a steam containing lid, so it’s cool to touch on the outside, and no steam escapes. It also doesn’t release heavy smells into the air. It can maintain the water temperature between 86- and 210-degrees Fahrenheit, and it does so within 1-degree accuracy. If you want it to, the Demi oven can even hold the water at your desired temperature for several days, and you can set the timer for up to 99 hours. The Demo Oven doesn’t run on a motor, so it’s completely quiet. It has a perforated bottom grill which makes it generate thermal turbulence. Although the machine’s interior appears small (the water bath has a 2.3-gallon water capacity), it can actually hold quite a bit of food. It comes with a stainless-steel rack, which positions your foods in the correct places. You can cook up to 12 four-ounce pouches of food at a time. The major drawback to this appliance is the price. At more than $300, it’s more expensive than the immersion circulators and most other sous vide devices. What you’re paying for is the high quality this machine offers. We tested and compared eight different sous vide machines that received some of the highest overall ratings. During testing, we considered these factors: taste of the meal, quality and durability, features, ease of use, speed and power, and price. We also compared the time it took to heat water from 78 to 135 degrees Fahrenheit using each machine. Additionally, we considered factors like tech integration, maximum capacities, noisiness, manual instructions (and how easy the instructions are to follow and understand), forum comments from users, customer support, and overall value (what you get for the price). When we could not test a machine, we used customer reviews, user interviews, and available online research.